Houthi forces launched a precision missile near the city of Al Hudaydah, reportedly killing four Sudanese soldiers. The soldiers were part of a coalition of Arab military forces on the ground in Yemen. The ongoing war in Yemen, which has displaced millions of people, shows no signs of resolution in the near future. On October 27, Houthi military forces introduced the new high-precision missile Badr P-1. This new missile was put to the test on the same day, destroying a Sudanese military base south of Al Hudaydah in Yemen. The Badr P-1 demonstrated a sophisticated military development for the Houthi forces. As the Houthis are reportedly supported by the Iran regime, this project was likely developed in coordination with Iran’s Revolutionary Guard. After Houthi rebels took power in large parts of the country in September 2014, the Arab states formed a coalition and launched a military campaign against the rebels. Saudi Arabia launched its first attacks in March 2015, starting with airstrikes aimed at Houthi positions in the capital city of Sanaa as well as Houthi air defense batteries and war planes. Saudi Arabia also started to gather a coalition of 150,000 troops for a ground assault, including troops from nine Arab countries: the United Arab Emirates, Bahrain, Kuwait, Qatar, Egypt, Jordan, Morocco, Senegal, and Sudan. Some western powers, including the United States, France, and the United Kingdom, have supported the coalition by providing weapons and intelligence. 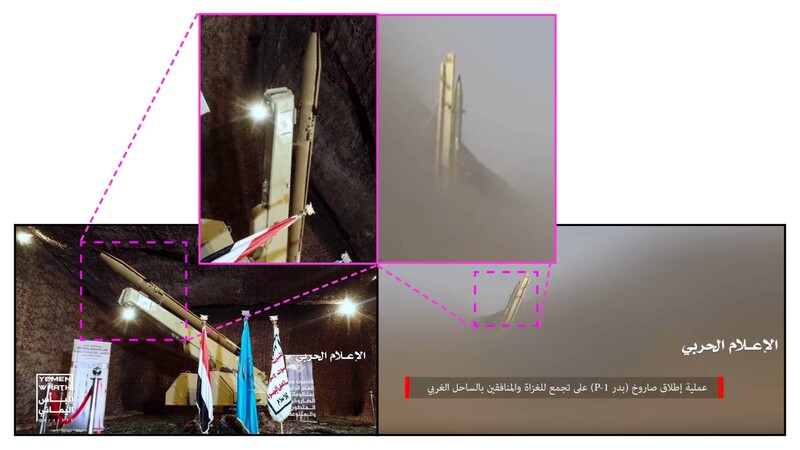 Meanwhile the Houthis have been supported by Iran, which provided the rebels with weaponry, including the Iranian long-range surface-to-surface ballistic missile Qiam‑1. The conflict in Yemen is often described both as a civil war and a proxy war between Saudi Arabian and Iran. On October 27, Iran-affiliated media outlet Press TV released an article introducing the new high precision Badr P-1 missile. According to the article, the missile was developed domestically and was designed to hit specific targets while minimizing collateral damage. The article had biases toward the Saudi-led coalition and strongly supported Houthi forces. Taking into consideration the reported Iranian support to “improve the Houthis’ ballistic missile capabilities,” this missile was developed with Iran’s help. Twitter users suggested that Badr P-1 missiles had visible similarities to the Iranian produced Fadjr-4 and Zelzal guided missiles. Nonetheless, the Badr P-1 missile visually looked closest to the Iranian manufactured Fateh-110, which also had the same type of rail launcher, similar to the Soviet designed S-75 launcher. Visual similarities further suggested Iran’s likely aid in the development process. 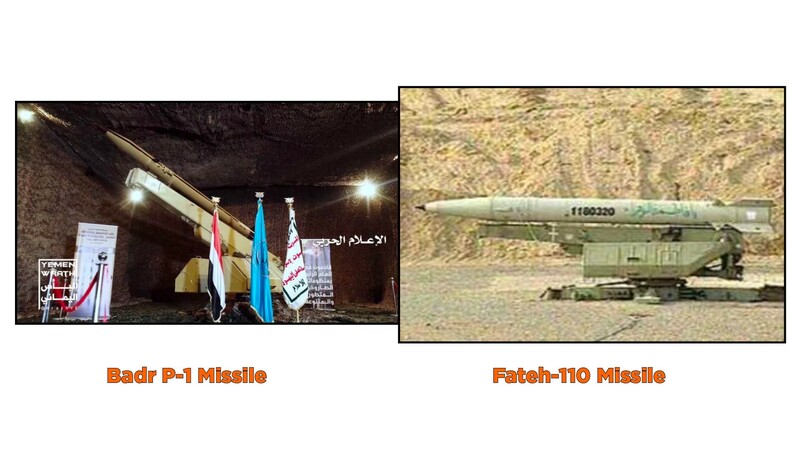 Visual comparison of Badr P-1 and Fateh-110 missiles. Left: (Source: YouTube / HOUTHIS the channel); Right: (Source: ynetnews.com). Shortly after the official introduction, Houthi forces released a video that showed a Badr P-1 strike on a Sudanese military encampment. The video was released on October 29, and the caption on the video claimed that it was taken on October 27. Surfaced video of the Badr P-1 missile launch. (Source: YouTube / HOUTHIS the channel). According to the video description, the missile launched in the video was the new Badr P-1. A visual comparison between still images and the video of the missile showed a strong resemblance to the newly introduced Badr P-1 missile, with the exception of the launching platforms. When introduced, the Badr P-1 missile was placed on a S-75 type of launcher, while in the launch video the mobile platform resembled a launcher used for unguided rockets, like Zelzal-2. This missile is an upgrade of Badr-1 missile, and according to the Press TV report has a pinpoint accuracy of three meters. Comparison of the Badr P-1 high-precision missile photo with the surfaced video. Left: (Source: Alahednews.com.lb); Right: (Source: YouTube / HOUTHIS the channel). To confirm the strike, @DFRLab geolocated the area seen in the drone footage posted by Houthi forces. The large roundabout located near the coastline served as the main landmark in the process of geolocation. Geolocation of the area. Left: (Source: YouTube / HOUTHIS the channel); Right: (Source: GoogleMaps). The video recorded the encampment being hit by a single strike, which caused a large plume of smoke to cover the base. The extent of the damage could not be determined due to the smoke and dust obscuring the camera’s line of sight. Daily satellite imagery of Planet allowed to assess the missile strike damage. 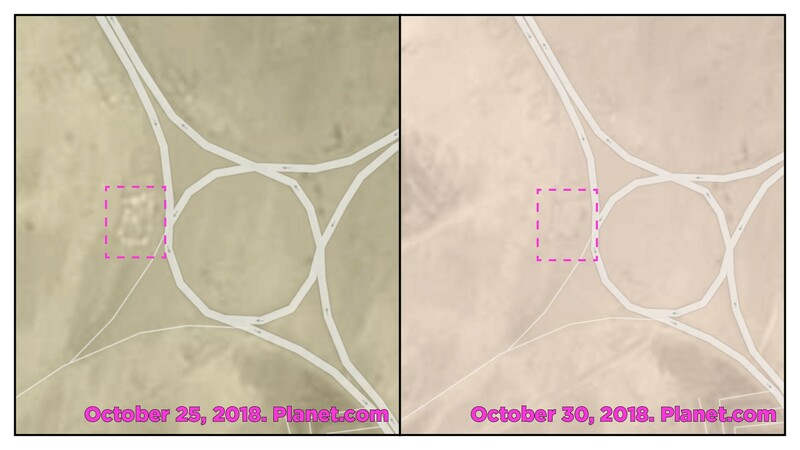 Comparison of October 25 and October 30 imagery showed a significant change of the area. 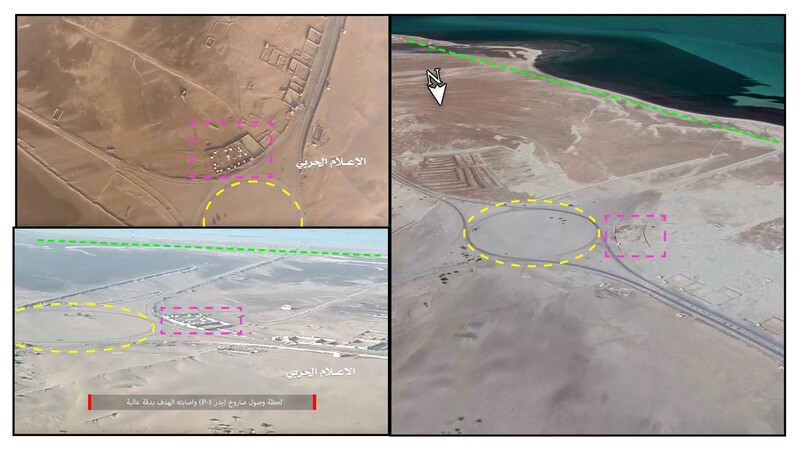 On October 30, the buildings inside the fenced area appeared to have been cleared out, confirming the authenticity of the released Houthi video. The actual purpose of the destroyed compound was not confirmed, as the area was not marked on open source databases, such as WikiMapia. Nonetheless, the presence of Sudanese troops in the area was recorded earlier in the year. On June 16, 2018, Sudanese forces fought together with pro-government forces to take the airport in the port city of Hudaydah from the Houthis. On October 29, 2018, Sudanese media outlet Sudan Tribune reported on the incident, claiming that the missile strike killed four and wounded 21 Sudanese soldiers serving at the base. Currently Sudan has at least 3,000 troops fighting in Yemen and has suffered dozens of casualties since the start of the campaign. In May 2018, growing concern for the high number of Sudanese casualties pushed some Sudanese parliamentarians to demand that their forces to be withdrawn from Yemen. After three weeks of signaling doubts, however, Sudan remained committed to the coalition. A Badr P-1 missile, newly introduced to the warzone, launched from an unknown location, killing four and wounding 21 Sudanese soldiers close to the city of Al Hudaydah. Iran, the main Houthi ally, reportedly has focused some of its support on improving the Houthi missile program. It is likely that Houthi forces received Iranian support during the development of these precision weapons as well. Increased use of precision-guided weaponry could help to Houthis to level the playing field against their more numerous and technologically advanced adversaries. The bloody conflict that started back in 2015 currently shows no signs of a possible end. @DFRLab will continue to monitor significant military operation and developments in Yemen.